LMG Guns – the best products at the best prices! The Camouflage AccuSharp Knife and Tool Sharpener will sharpen knives, even serrated knives, cleavers and many other cutting tools without oils or stones. The compact size is great for the toolbox, tacklebox, gear bag or backpack. The large ergonomic handle has an attractive camouflage design and fits either hand safely and securely while the full-length finger guard protects fingers. Sharpening blades are diamond-honed tungsten carbide for years of reliable use. 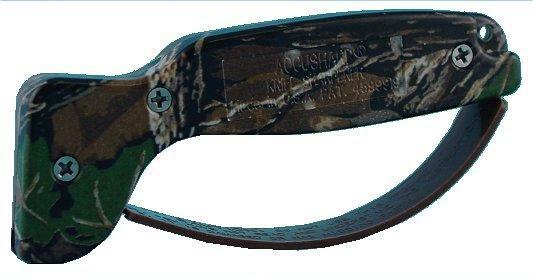 Camouflage AccuSharp Knife and Tool Sharpener will not rust and can be cleaned with soap and water or in the dishwasher. Send your SSI invoice for your initial purchase of an AccuSharp tool to Fortune Products, and they will send you a counter display complete with a AccuSharp tool at no charge.